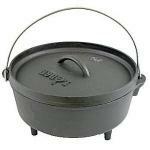 A Dutch oven is a large cooking pot, usually made out of cast iron. It dates back at least as early as the 17th century. This cookware retains its Dutch heritage in terminology because in centuries past, the Dutch system was more advanced than even the English; thus, surrounding kingdoms would import Dutch cast iron pots to use in their homes. Other cultures have their own terms for the same cooking pot, like the French cocotte, English casserole dish, Japanese tetsunabe, Australian bedourie, and South African potjie. Models like the Lodge Cast Iron Dutch Oven (at right) are a lot like what our ancestors used hundreds of years ago. Explorers and settlers used it for baking, boiling, roasting, frying, and simmering stews — sounds familiar, right? That’s the beauty of a Dutch oven. 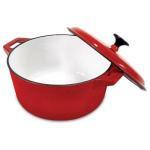 One versatile cooking pot can be used for a wide variety of applications in the kitchen. 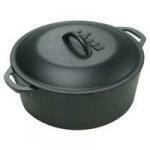 Cast iron is a long-standing favored material in a Dutch oven. But over the years, other modern materials and manufacturing techniques have made their way into this piece of culinary history. Some make it possible to forego the seasoning process altogether. But what exactly is “seasoning?” This prep step removes any residual chemicals or materials that may still be left over from the manufacturing process, such as wax, rust, or oil. Use soapy water to wash it off by hand, then pat dry or place inside a warm oven to remove every trace of moisture. Next, coat the inside of the pot and lid with cooking oil. Place inside a 350-degree oven for 1 hour, remove and cool, then repeat. After the second hour, the Dutch oven should have a nice shine to it. This process should not need to be repeated unless the cookware starts to rust. Many Dutch ovens these days come pre-seasoned, which means the manufacturers did all of the above steps already. This can be a huge time-saver. While the knowledge of how to season a cast iron pan is good to have, it’s also nice to have the luxury of pre-seasoning available as an option while shopping for Dutch ovens, choosing convenience over control. The crème de la crème of Dutch ovens on the market is from Le Creuset — although they call theirs a French oven. It’s also the most expensive. But as the saying goes, you get what you pay for. The quality of cast iron and enameled materials, the balanced and fitted lid for a tight seal, even cooking distribution, and a lifetime warranty are all factors that contribute to a durable product like the Le Creuset. If shopping on a budget, then the Tramontina Dutch Oven is your best bet. 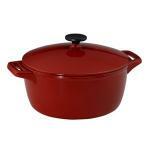 It’s the most like Le Creuset’s beloved French oven and was even given top-notch ratings by America’s Test Kitchen. It also comes pre-seasoned out of the box, so that’s one less step to worry about. For the tried-and-true black cast iron Dutch oven, Lodge makes many products in both pre-seasoned and traditional models. The traditional style could also be called a camping stove. It’s fitted with small legs and a long wire handle for use over the campfire. The lid can be used as a griddle, too. 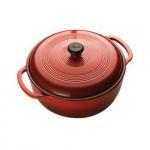 Le Creuset has been handcrafting cookware in Northern France since 1925. Their quality and workmanship show in products such as the French oven. The basic design of this oven (some use the term Dutch oven) has been in use for centuries, so you know it is effective.